Toshiba might not be a name that many would associate with ebooks, but this gadget maker has just launched their second ereader, the Bookplace Mono. The Mono has a 6" HD E-ink screen (1024x758), with Wifi, touchscreen, 4GB of storage, a microSD card slot, speaker, and a headphone jack. Toshiba is boasting that the Mono has a runtime of 8,000 page turns. 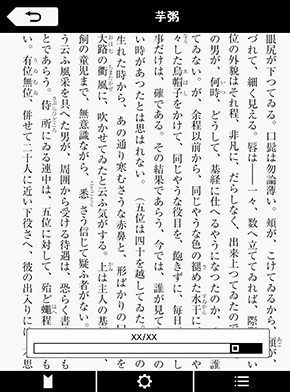 This ereader supports Epub and XMDF ebook formats, but is designed to buy ebooks from Toshiba's ebookstore, Bookplace. It is also going to offer a text to speech feature which will be based on Toshiba's proprietary Speech Synthesis technology. When the Mono ships on 16 April it will only be available in Japan. 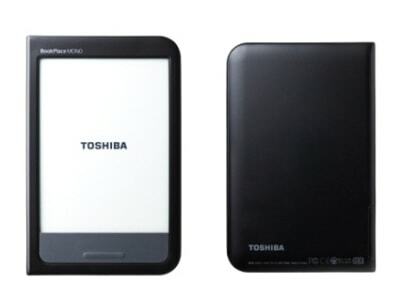 Toshiba has partnered with 5 major Japanese bookstores to sell and promote BookPlace and the Mono ereader. Retail will start at 13,900 yen (about $145 USD). In other news, Toshiba also announced today that they are relaunching their ebookstore Bookplace, and that it will now be supported by Booklive, a Japanese ebook platform. Bookplace had previously been supported by Blio and sold ebooks in that format, but that will no longer be the case. Along with the relaunched ebookstore Toshiba is also releasing new reading apps for iOS, Android, and (coming next month) Windows. The Mono is a more limited device than its predecessor, the DB50. That "ereader" was actually a 7" tablet running Android 2.3. I have a DB50, and I found it to be frustrating and not really worth the expense or the effort needed to convert it to English. To be fair, the DB50 (and the Mono) was always intended to be sold in the Japanese market. Both devices were only supposed to buy ebooks from Bookplace, though they can support ebooks from elsewhere. So my difficulties in trying to use it in English were largely self-inflicted. As if someone needs another 6″ ereader…. Can ANYONE produce a more normal size (like 8″ or 9″ finger-touch, with built-in light) to fit between the cheap 6″, which are too small for immersive reading and the 9.7″, which may be a bit large for some people? “Toshiba is boasting that the Mono will last for 8,000 page turns” I was so surprised at this (it dies after 32 250-page books!) I went and looked at the Japanese site. The Japanese has “8000 page turns on one charge”. Oh. That is good.